Cricket is a game of sheer luck, you never know what is written for you today. A formidable side bites the dust and a minnow stuns a cricketing giant even with low profile players. Different Indian captains had sweet and salty experience in champions trophy which kick started in 1998. 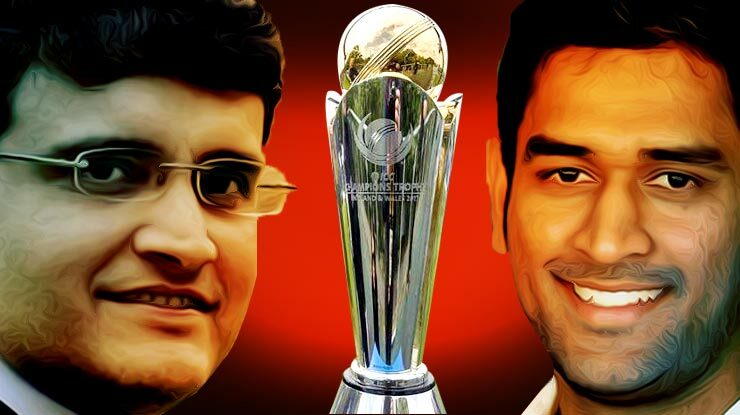 Especially Sourav Ganguly and Mahendra Singh Dhoni, the Fortune had different plans for them on the field. In the early twenties, Sourav Ganguly was handed the reins of Indian cricket after Md Azhruddin’s text book captaincy costed team in WC 1999. Besides, the Ginnie of match fixing haunted the Indian team giving a clear indication of Groupism. Popularly known as Prince of Kolkata, Saurav had a daunting task ahead of the champions Trophy organized in Kenya in 2000 as it was a knock out tournament. Yes, one defeat and pack your bags. Interestingly, Indian team lead by Sourav Ganguly did exceptionally well in the tournament . The young guns Yuvraj Singh and Zaheer Khan provided the X factor to the team. No cricket expert expected that men in blues will knock out Aussies who were almost invincible in that era. The presence of Yuvi took the fielding standard of the team to another level, which was evident in a 20 runs victory. Not only Aussies, the team made bite dust South Africa , A team for which Nairobi was a home away from home. When you defeat the world’s top two seeded teams, fans don’t expect you to lose the final against Newzealand. Probably Fortune was not on the side of Dada. While batting first India were nicely placed at 180 for 2 and still failed to reach a three hundred. While chasing 264 Kiwis lost half their side on 150, but a dibbley dobbly of cricket Chris Cairns and Chris Haris took kiwis to a famous 4 wicket victory. In year 2002,Saurav had another chance to grab Champions Trophy. A marathon ton by Md Kaif against Zimbabwe and Sehwag’s lethal century against England saw India in the semifinal where they had to again face Proteas. India chocked South African after Centurian Herschelle Gibbs retired hurt due to diarrhea. India was in the finals again, this time against Srilanka. However, clouds had different plans for men in blue. The final was played twice and Sri Lanka batted on both rain affected days and set the target of 244 and 222 before India team. Respectively . The rain halted the proceedings on both the day when Indian batsmen were out In the field to chase. At last , the trophies were shared between Saurav and Sanath making the former captain more disappointed. Clearly, in 2000 and 2002 Suarav was one step away to lift CT. So close yet so far, Dada. While Mahendra Singh Dhoni was already a legend for Indian cricket before leading his side in champions trophy 2009 for the first time. However the team India fumbled and lost to arch rival Pakistan and an abandoned match with Australia paved the way for an early exit. Before stepping into his next champions Trophy MSD’s dominance in Indian cricket was double folded as he lead the side to lift WC 2011 after a wait of 28 years. Team India went to England with the scars of match fixing in the recently concluded IPL. The opening combination of Shikhar Dhawan and Rohit Sharm and left arm spinner R Jadeja made life difficult of all the teams. Men in blue were literally cruising and remained unbeaten before facing the home side in final. Again rain interrupted, but that proved to be blessing in disguise for Mahi and Company as the game was reduced to 20 over a side. So the final was literally a T-20 match, which suited best to the then men in blue. While England used to have an entirely different team for T 20 internationals. That’s not all the Trophy had almost slipped away from Dhoni when it looked like Morgan and Bopara will take England home. Till Ishant Sharma chipped in and took the duo in two deliveries in a trot. Last over of Ashwin sealed a famous victory for India. Undoubtedly the team played well ,but Mahi was also fortunate enough to not face Australia or Kiwis at any stage in the tournament. So this is How cricket goes, two Legendary Indian captains had a different share of luck in champions Trophy. One was so close to grab the title, but the rain played the spoilsport While for the other rain proved out to be as a blessing. Lets see What has written in the Champions Trophy Book of Fortune for Virat Kohli.